Why Do Only Two Major Dance Suppliers Offer Shoes for Ballerinas of Color? Dancers in Dallas are still stuck "pancaking" their shoes to match their skin tone. Dancers who wear pointe shoes endure a seemingly endless search for the perfect shoe. From the time they fit their first pointes, they attempt to find a shoe that will suit their unique foot and support their dancing. The work isn’t done once they make the purchase, as many dancers make customizations to the shoe – from cutting the shank, darning the box, sewing on elastic and ribbons, and breaking in the shoe until it is danceable. This can feel like a lot of work for a shoe that is often more than sixty bucks a pop, sometimes as much as $130 – especially considering that professional dancers can wear through a pair of shoes in as little as a day or a week. Pointe shoes before and after pancaking. Courtesy of DBDT. These barriers are slowly being torn down. 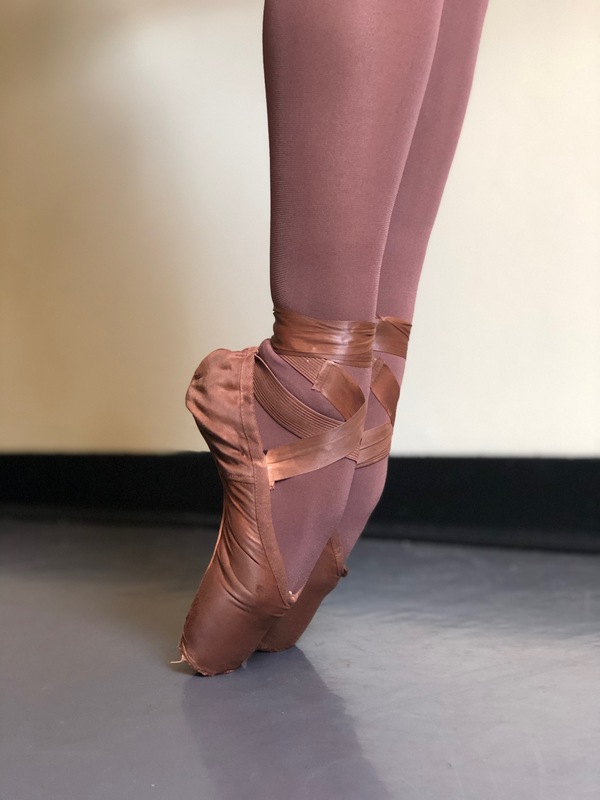 As of October, Freed of London, one of the largest manufacturers of pointe shoes in the world, announced that they would now be selling shoes in satin hues perfect for black and brown dancers. It’s not the first brand to make this sort of step toward inclusion. Last year, Gaynor Minden began to offer different finishes in their customized pointe shoes, in either “Mocha” or “Cappuccino” satin. 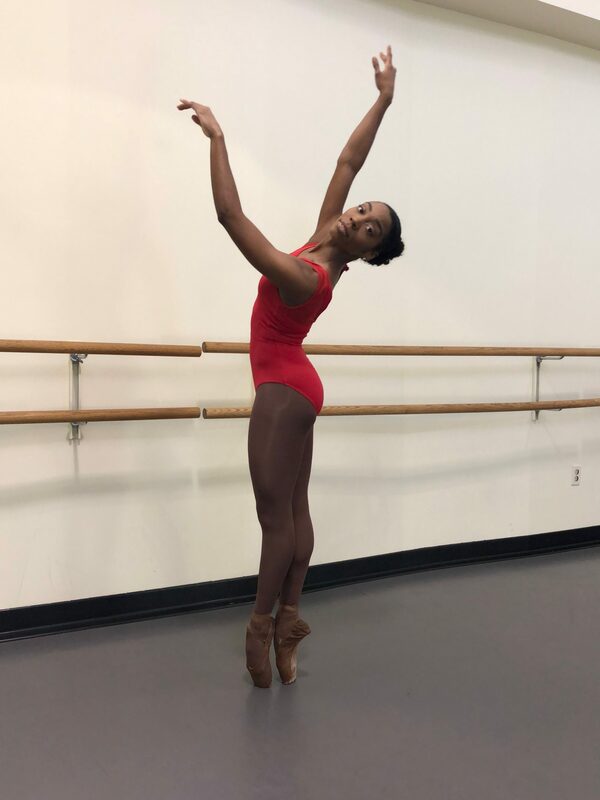 The company now boasts the endorsement of artists like Michaela Deprince with the Dutch National Ballet of ballet documentary First Position fame, as well as English National Ballet’s Precious Adams, and Daphne Lee of Dance Theatre of Harlem, as they can now buy shoes without having to go through the tedious process of pancaking them. While these two dancewear companies are making strides, they are just two companies. For Dallas-based dancers, the process can be even more complicated. Only two makers in the world sell shoes for dancers of color, and neither of them are based in Dallas. One of the biggest suppliers of shoes in the Dallas area is the brand Capezio, which has a store on Lover’s Lane, but it doesn’t offer shoes in anything but pink shades. The hope is that the progress made by these two companies will lead to larger change in the dance world, as other pointe shoe makers will realize there is a market for dancers of color. Currently, Dallas dancers are in a bind. They can buy the pink shoes and pancake them to match their complexion, or they can go through the guesswork of ordering shoes that do come in their skin tone online. For young dancers just starting en pointe, this makes the search for the perfect shoe even more complicated. Many of the dancers currently working in Dallas are hoping that the work of Freed and Gaynor Minden will bring larger change. Sierra Noelle Jones, an artist with the Dallas Black Dance Theatre, is optimistic. Sierra Noelle Jones. Courtesy of DBDT. 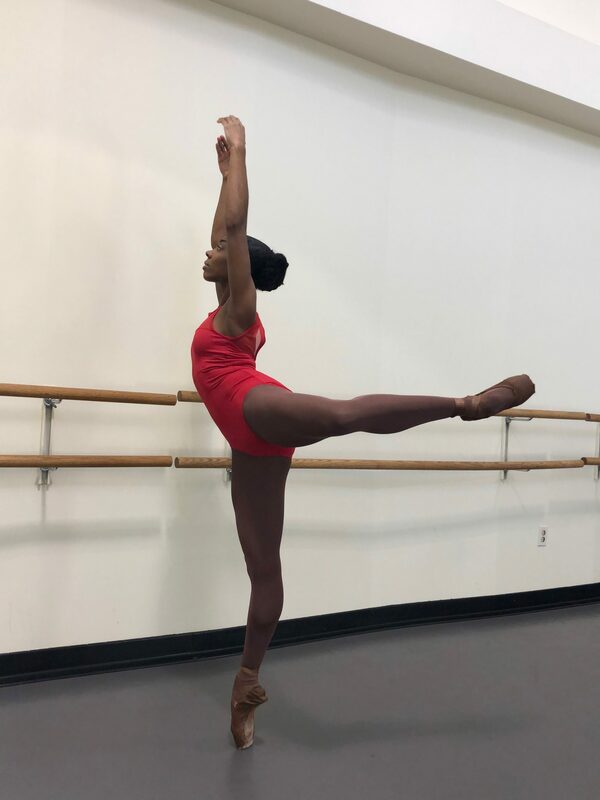 Dallas Black Dance Theatre doesn’t always do pieces en pointe, but when they do, they ask their dancers to wear shoes and tights that match their skin tone. This is the protocol followed in other companies that are primarily made up of dancers of color, such as Dance Theatre of Harlem or the British company Ballet Black, which was actually the inspiration behind Freed’s new line of shoes. But many ballet companies aren’t catching on. Ballet has been very whitewashed for a very long time; There is even a tradition in ballet of performances having a “white act,” which comes from ballet choreographed in the Romantic period, featuring women as ghosts or spirits in all-white tutus and skirts. The assumed whiteness of ballet often makes it hard for dancers of color to feel like they fit in, especially when there aren’t shoes that match them. Much of a ballet’s storyline is made up by the corps de ballet, a group of women who dance in unison and create the mood and the backdrop for the performance. They are the swans in Swan Lake, the snowflakes and flowers in the Nutcracker, the party guests in Cinderella and Sleeping Beauty. These dancers are expected to dance and look identical. Sometimes companies put black dancers in the pink tights and pink shoes to match the other dancers, which essentially cuts them in half at the waist, like Pacific Northwest Ballet did with Amanda Morgan in Nutcracker’s Waltz of the Flowers. Other companies have decided to put their black dancers in tights and shoes that match their skin tone, such as what English National Ballet is now doing with Precious Adams. For the aesthetic, most dancers prefer to match their skin tone, as there is a continuation from torso to legs. Sierra Noelle Jones, courtesy of DBDT. 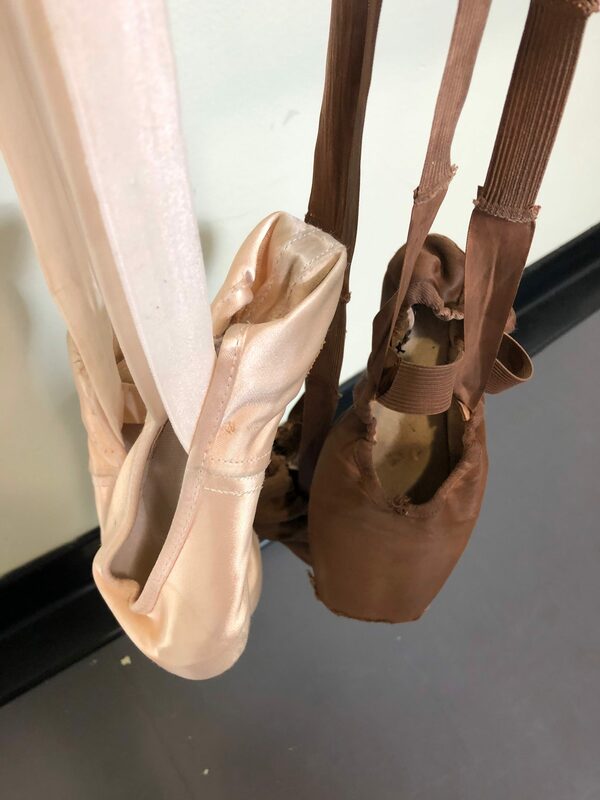 Despite the progress made by Freed of London and Gaynor Minden, many dancers of color are still stuck with the laborious task of pancaking as they wait for other major pointe shoe brands to catch up. Jones wears the brand Russian Pointe, which has a shape that fits her narrow heel and wide metatarsals the best. Ironically, Russian Pointes are known in the ballet world for being unusually pale. Every time DBDT does a piece requiring pointe shoes, Jones must transform her shoes from pink to brown. She uses cheap foundation from CVS, applying it with a toothbrush or a beauty blender. Some dancers use spray paint, which can cause the shoes to crack, or even special paint, which can be expensive. Jones also has to paint her ribbons, which come separately from the pointe shoes and must also match her skin tone. It’s an extra step required of all non-white dancers. In many of today’s predominantly white companies, dancers of color must ask their director which color shoes they think is appropriate for them to wear. Since many dancers are taught that they are replaceable, with hundreds of other girls jostling for a spot in the company, they don’t feel as if they can speak up. Even for dancers in a company like DBDT, there are obstacles. When on a photoshoot with a photographer not connected to the company last year, Jones was asked not to pancake her shoes, as they seemed less “pristine” that way. Still, finally seeing her skin tone in major dancewear lines makes Jones feel as if women who look like her are finally being included. It’s starting to eliminate these extra barriers for non-white dancers. With two of the leading brands in dancewear on board, it’s only a matter of time before the rest follow suit. “I’m even more interested and proud of these companies for kind of stepping up and realizing that it wasn’t just a phase in dance, it wasn’t just like ‘oh, the interest is short lived,’ but that we’re just as successful in the ballet world, that now it’s equally as important to make a shoe for women of color or men of color,” Jones says. While she still is pancaking her shoes for now, Jones is hoping that soon she’ll be able to find her shade in any pointe shoe brand.